During her 28 days rehab stint, former model Katie will be subject to a curfew but will be allowed to return home to look after her kids in the evening. It is also reported that she has had her phone confiscated and has been instructed to keep away from all forms of social media. Should the 40 year old break the clinics rules or is deemed to be a threat to herself, it is understood that she will be required to stay at the Priory for residential treatment. It could be said that heading to rehab has been a long time coming for the reality TV star whose life has been on a downward spiral for some time now. Earlier in the year, she split from her husband Kieran Hayler who she claims cheated on her seven times during their 5 year marriage and was the reason why she ‘hit rock bottom.’ The threat of bankruptcy along with the hefty cost of upcoming divorce to Hayler have put the 40 year under huge financial strains. Katie broke down on an episode of Loose Women when speaking about her mother’s illness. 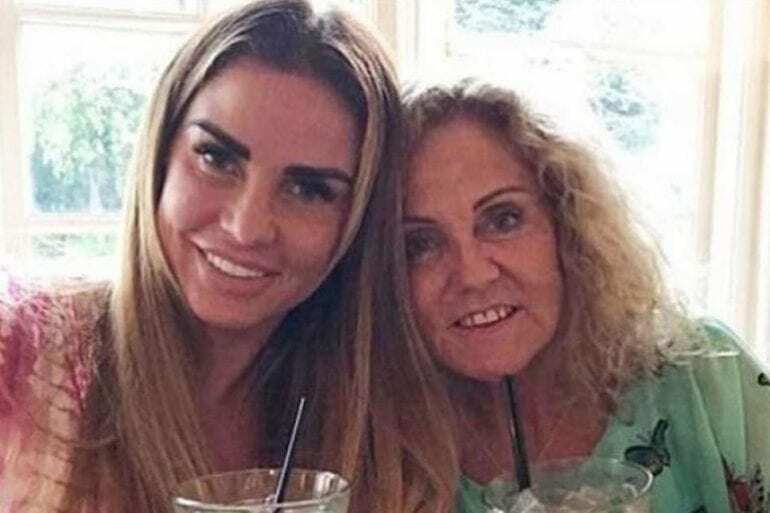 Adding to her woes, her mother Amy has been diagnosed with a terminal lung condition. Katie broke down in tears on an episode of ‘Loose Women after admitting her worse fears over her mum’s death. Her mum’s illness is called idiopathic pulmonary fibrosis, a lung condition with no known cure. Unfortunately, the median survival of patients with IPF is only two to three years. Amy Price plays a big part in caring for Katie’s disabled son Harvey. She is said to be concerned about the ‘round the clock,’ care that he needs with her mother’s ailing condition. He was keen to make a point that his kids are his priority and that he shields them as much as possible from tales of Katie’s partying and wild ways. Peter, 45, previously asked Katie to have a drug test but she refused. He currently has custody of their children Junior 13 and Princess 11 but if Katie completes a 28 day stint in rehab, Pete will go back to sharing custody of their two kids with his ex. The Mysterious Girl singer has continued to remain low key about his troubled ex choosing instead to react to the news of her upcoming stint in rehab by posting a photo on Instagram of his wife’s new BMW alongside his son’s mini version of the vehicle. Pete captioned the picture: “As far as cute photos go…….. The ex-Atomic Kitten star has backed her long-term friend after it was revealed that she would be undergoing treatment at The Priory for post-traumatic stress disorder. After hearing the verbal abuse aimed at Katie over her recent wild behaviour following her marriage breakdown and mum’s terminal illness diagnosis, former Atomic Kitten singer Kerry responded in the following way: “Everyone’s quick to jump on the bandwagon and notice all her faults. Kerry became close to Katie during their time on I’m a Celebrity in 2004. Kerry, who was diagnosed as bipolar some years back feels she can relate to what Katie is going through. Talking about when her first marriage to ex-Westlife star Brian McFadden ended, Kerry said: “I was living the dream and it all went t*ts up and everything started spiralling out of control. Accusing the men in Katie’s life of ‘using’ her for publicity, Amy lashed out at Katie’s estranged husband Kieran Hayler and exes Alex Reid and Peter Andre urging them to consider their own behaviour and “take some responsibility”.